The audience cheered at the end of Jimmy McLaughlin’s rendition of ‘Dear Old Inishowen’, not only because of his fine a cappella accomplishment but also because he was singing it in McGrory’s front bar in Culdaff, the heart of his dear old Inishowen . He was here because his family was the subject of an Irish television series called Dúshlán 1881 – Living the Eviction, about famine evictions from the nearby village of Carrowmenagh, and they were having a screening in the hotel to celebrate. I was there to begin exploring the wilderness that remains all around this northernmost point of our island, but right now, in this cocoon of Culdaff, my cultural immersion was like an unexpected and delicious appetiser. I couldn’t have hoped for a better start to my weekend on Inishowen where my ultimate aim was to get to Inishtrahull, the northernmost island in our waters, just ten kilometres off Inishowen’s Malin Head. I was to kayak to this now deserted island with new adventure company Far and Wild, based in Derry, which explores Inishowen in the most eco-friendly ways possible. By paddling, hiking and, most exciting of all for this recent convert, coasteering. Coasteering is the good old fashioned way of traversing a coastline, clambering through sea arches, swimming across otherwise inaccessible inlets and jumping off rocks into the waves. “I’m sure my mother warned me not to go away for weekends with men like you” I shouted to Lawrence McBride, founder of Far and Wild, as I stood on top of a pretty high rock just after he had jumped into the water and was waiting for me to follow suit. Which I did, and loved every second of my boldness. The weather was also bold that weekend however and, after several checks with the coastguards, the Far and Wild team of expert guides decided that we wouldn’t be able to get to Inishtrahull this time around. They might jump off rocks and kayak into the waves but they aren’t stupid, and from beginning to end I felt secure in their knowledge and expertise. “Because the conditions are extreme and unpredictable up here, our itineraries are never fixed in stone,” said Lawrence. I rather loved this organic interaction with nature and, in particular that they include wild camping as part of their break. You never know in advance where you might end up sleeping that night, but if our chosen bay at White Strand was anything to go by, these guys don’t settle for any old patch. There was no one around for miles, soft and sheltered grass to pitch on, and a stony beach to create a camp kitchen. Not forgetting the stunning views across Trawbreaga Bay, the Isle of Doagh peninsula with Fanad Head glistening beyond that and Mount Errigal towering above West Donegal in the distance. Mind you, I would have slept in the back of a kayak I was so tired at the end of the day. After we realised that Inishtrahull wasn’t going to happen early that morning, and we got clearance from the coastguard, we headed off in our state of the art kayaks from a tiny inlet, just east of Malin Head, where an ancient well, church and hermit’s cave called “The Wee House of Malin” marks the spot. I was in the front of a double kayak with Lawrence who, along with another of their kayaking experts, Gareth Blackery, guided confidently and firmly. “Paddle straight into the swell, not alongside it, and you’ll be grand”, he shouts as I relished each stretch I take into these Atlantic extremes. We paddled like this for a couple of hours, admiring the cliffs and sea stacks from afar, but staying clear of the white water which smashed against the coastline. Then suddenly it hit. Although the waters weren’t crashing out here, they were definitely swelling. My stomach started to move in syncopation and, almost without warning, I was feeding my breakfast to the fish. “Better out than in”, Lawrence said, reassuring me that this was normal but it was best to be sick onto the spraydeck which covered our kayak rather than over the edge. There is always a tipping point in a kayak after all. A quick splash of the face with seawater and I was right as rain and ready to tackle the next headland. I even tackled lunch, a picnic prepared by the company, which we had on Breasty Bay, tucked in behind some whale like granite slabs to provide shelter from the omnipresent winds. 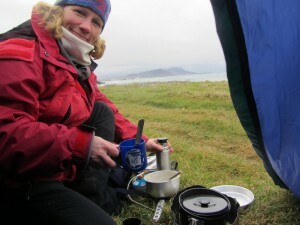 This was the point when I remembered my extra warm layer tucked into a dry bag with my lunch. Never have fleece and a flask felt so welcome. After a couple of hours’ more kayaking further west, we let the current carry us into the more placid Port Ronan, where the team had cleverly shuttled our minibus earlier, so that we didn’t have to transport camping gear on kayaks. Farren’s Pub, our nearest drinking hole before zipping ourselves up for the night, was also a welcome shelter from the wind, after pitching and pasta-ing at the beach. 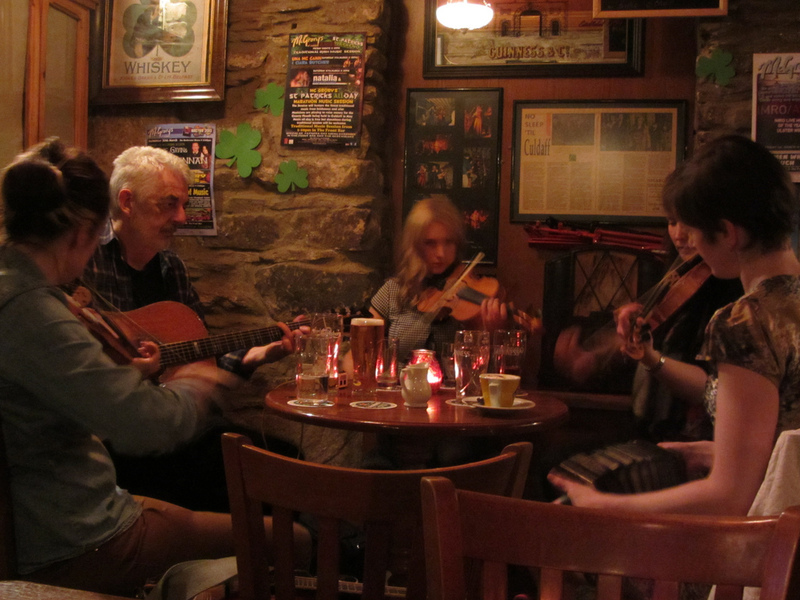 This is Ireland’s most northerly pub, and there is nothing like a day’s kayaking around Malin Head to get the conversation going in a region that is pretty much off the tourist trail. When we told them that we might be swimming in the sea tomorrow, they just gave us another hot whisky and looked on sympathetically. No sympathy was needed, however, and no skills either for the next day. After a fine sleep, with layers of down and fleece to combat the untimely near zero temperatures and a vat of porridge, we started a hike down the beach in the direction of Five Finger Strand, a few headlands away. In Far and Wild’s inimitable style, we negotiated the rocky shore as we went, “Use four point contact” Lawrence said at points where we need both hands and feet to scramble up grassy slopes when beach walking became impossible. Those of us who wanted a little more adventure had wetsuits and helmets in our backpacks and, just as Five Finger Strand came into view, we changed on the rocks, gave our gear to those who were hiking and coasteered our way back to camp. 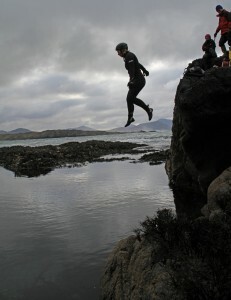 The high quality neoprene covering us from top to toe, buoyancy aids and helmets meant that we could jump and jiggle our way along these wild Donegal surroundings in comfort, caution and with childlike cheer. 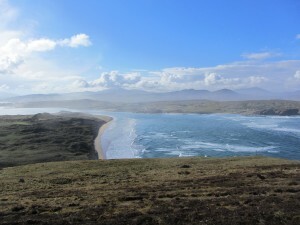 As we swam back into White Strand, the words in Neil McGrory’s (of McGrory’s Hotel) on the history of Inishowen – Inishowen: A journey through its past revisited. Yes, that’s the sort of bar they have in Inishowen. One which has its own historian at the helm. At one point he quotes James McParlan’s 1801 Statistical Survey of Donegal who writes about pilgrims at Malin Head. Apparently, after prayers they finish with “a good ablution in the sea, male and female, all frisking and playing in the water, stark naked and washing off each other’s sins”. I for one, was fully cleansed in that case. Although I will always swap neoprene for nakedness in the Atlantic. They do like to do things differently up here on Inishowen, however. According to Liam Campbell, a brilliant cultural historian who joined us as a guide on day two, “Inishowen is isolated but independent, with people trying to do things a little differently here. Which is a good thing and why I like helping out with Far and Wild’s trips. They take a holistic approach. They not only bring people out into the wilds of Donegal, but they show how these landscapes have shaped the people who live here. That is rare in tourism”. It is also rarified. In that this ‘Dear Old Inishowen’ is a place to have pure, unadulterated fun. Far and Wild offer a variety of packages. The two night adventure costs €375 sterling pps including all equipment, two dinners and breakfasts, one packed lunch, expert guides, airport transfer, one night’s accommodation at McGrory’s Hotel and one night of camping (+44 (0) 7775 911198, farandwild.co.uk) . An edited version of this article by Catherine Mack was first published in The Irish Times. 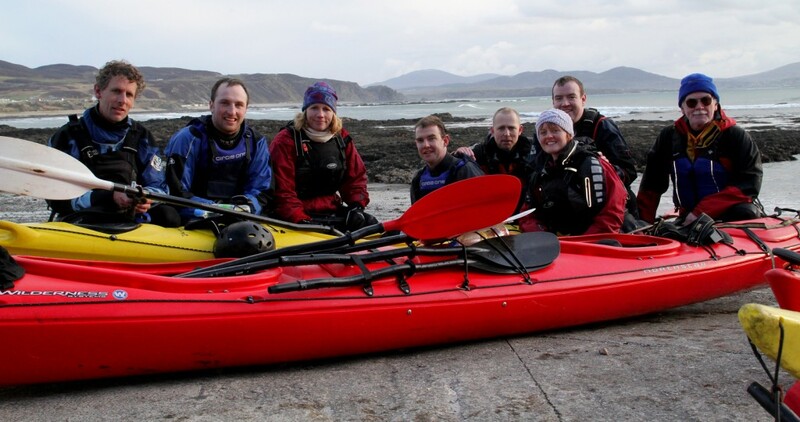 This entry was posted in Articles, Guides & Gear and tagged coasteering Ireland, Derry, ecotourism Ireland, Far and Wild, green tourism Ireland, Inishowen, kayaking Ireland, places to stay Donegal, places to stay Ireland, things to do Donegal, things to do Malin Head. Bookmark the permalink.